Apart from the ko-uta style of ballad, which is plucked with your fingers, all other shamisen genres are played with the Bachi(pick) held like when you play a guitar. The correct and natural way to hold the Bachi is to feel the beauty all the way to your fingertips. The part of the Bachi you hold is square, and the tip is thin and opened out to resemble the leaf of the gingko. They can be made of a number of materials, such as water buffalo horn, ivory, wood (oak, box, holly), tortoiseshell, and the qualities of the sound from the Bachi will change depending on its thickness and pliability. Professional performers will have their bachis adjusted when they buy them to suit their preferences. To a certain extent the size and materials used is already decided according to the genre, but it can be said there is more choice due to personal preference. 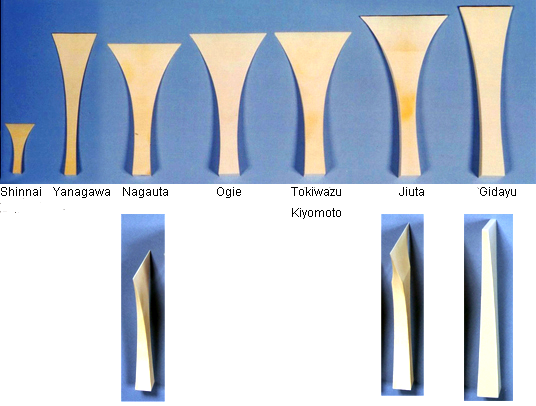 The dimensions of the bases of ivory bachis are known as ‘sai-jirii’. With wooden bachis, in order to make up the weight, monme of lead were added (an old Japanese measurement equal to 3.75 g). In relation to that, bachis would get bigger. The following is a table showing an example from each genre. Talking about the materials and way of making Bachis, we can see that wooden ones bend appropriately, and this helps the threads last longer, while being easy on the wrists to play, therefore making it hard to get tired. There is more flexibility in the tip with boxwood than oak. Also, if it breaks, it has the advantage of your being able to trim it down to fix it. There is an ideal place to hold a Bachi, and with ivory this varies between those made from one single tusk, known as maru-bachi, and those made from two, or hagi bachi. There are two kinds of tortoiseshell Bachis, one made of two pieces laminated together, and one made of one. 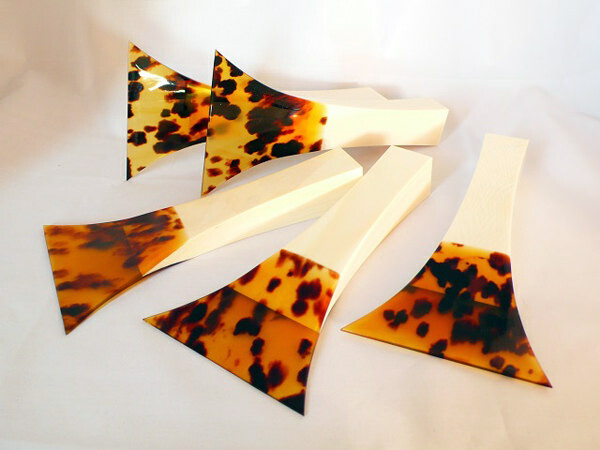 Nowadays, all tortoiseshell Bachis are rare, and most of the tips of the Bachis are made of tortoiseshell with some other material. These are prone to chipping, so they are often made with more durable synthetic fibres that can imitate the feel of the real thing. What is referred to as ivory tone and tortoiseshell effect Bachis have a durable degree of pliability. Beginners also use other inexpensive materials for Bachis, such as plastics and transparent acrylic, and there are some materials, again like some acrylics, which while they go against the traditional image of Bachis provide some fantastic flexibility and tone. 1 Line your thumb up along the sharp edge of the Bachi. 2 Place your little finger into the base of the Bachi, and brace the fingertip parallel to it. There is a lot to remember about how to hold the Bachi, but taking care not to have your little finger too slack is one of the more important things. 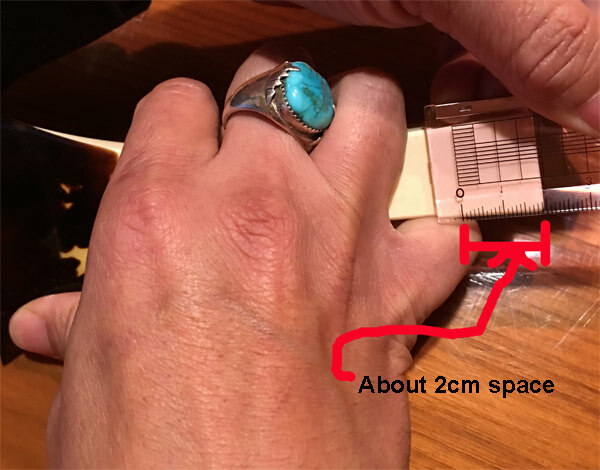 Having your little finger within one or two centimetres from the base of the Bachi is probably about right: any more than that and you should look at trimming the Bachi If it is too long it will hit the body of the shamisen and may cause some damage to its skin, or cause pain in the player’s wrist or arm. 3 The remaining three fingers, the index finger, the middle finger, and the ring finger are fixed at the centre of the Bachi, being careful not to put any power into your fingers and to remain relaxed.